I advertised at a handful of Brother Scott Book of Mormon evidences presentations last month. A couple were at the Salt Lake Community College right off the freeway in Sandy. I stood outside next to the frontage road. While waiting for more people to come out of the parking lot, I put my sign up on the fence for the freeway to see! One girl pulled over with another car. She came to ask me what religion I was. I told her I was a Christian, and then she asked if I thought what I was doing was Christian. I shared with her how my warning of false prophets is as Jesus and Paul did (Mat. 24:24 and Acts 20:29-31). She turned to walk away saying simply, "Well I hope it makes you happy." 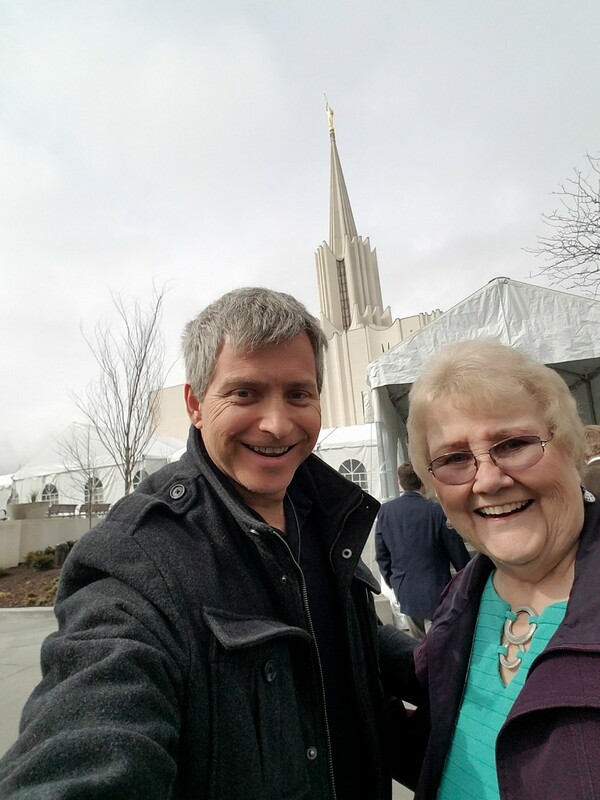 I was telling her when she was walking away, "You need to know that Joseph Smith was a false prophet and he's leading you to hell." At another event there, another car stopped that I was able to give a DVD to. 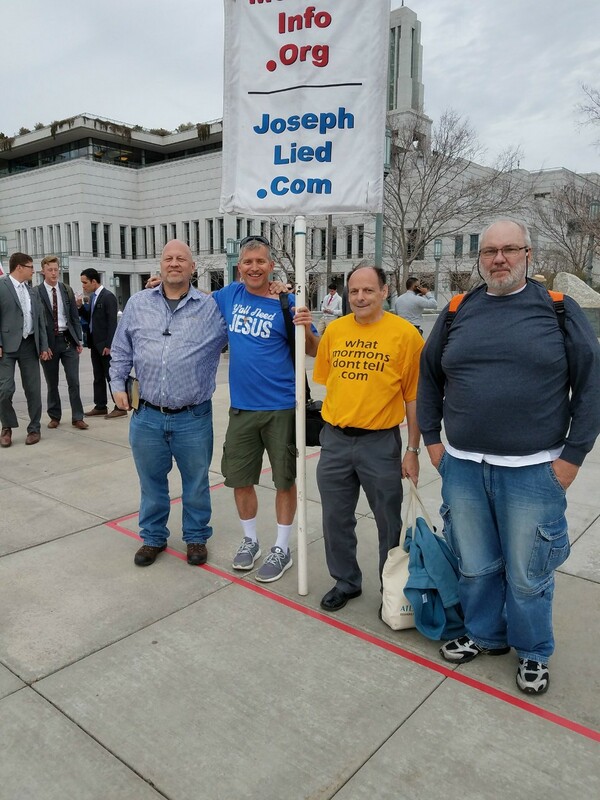 He said he wasn’t Mormon and was going to go check out JosephLied.com. Here’s my critique of Brother Scott’s third presentation on evidences for the Book of Mormon. I don’t know what is going on, but his last advertised presentation was on the 26th of last month. Usually Scott is quick to update his schedule. I pray he has read these critiques and is not planning any more of these events! He claimed to have six total presentations, so I am half way done with my critiques. The Jordan River Temple opening began on the 17th. However, I was able to get a VIP tour for pastors with some friends who stayed with us from Colorado a couple days earlier. They are members of Ratio Christi, which is a Christian apologetics organization for transforming secular universities. They knew Pastor John Doss of Discovery Community Church here in the Salt Lake area, and he was invited for this VIP tour. Sandra Tanner of Utah Lighthouse Ministry goes to that church, so John invited her to come as well. After I arrived, I was pleasantly surprised to see three pastors from my church had come to take the tour as well! Of course Sandra and I asked most of the questions during the tour. The open house has been very difficult for getting literature out. The LDS faithful are extremely closed-minded here. I plead with just about everyone who passes by to be a little open-minded and see what someone else believes. However, advertising my site is certainly drawing people to it. 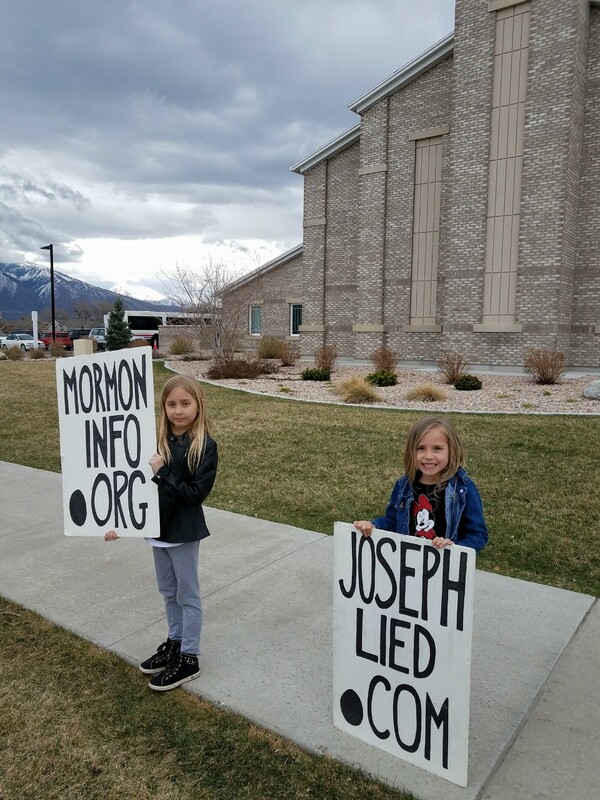 It was great to have my daughters out helping me advertise one afternoon. It was getting cold, and they didn’t last long, but it was still fun. It was Zoe’s first time to help me out on the street. During one evening of ministering in front of the open house, some lady in a truck pulled out of the parking lot and gave me the finger. She came back and pulled over to ask me if I have anything better to do with my time. Of course I told her no, I don’t have anything better to do with my time. I also got to talk to an atheist who lives in the neighborhood. Daddy's helpersOn another day, Keith Riley, Ed Havaich, and Joe Bee came to help distribute literature. By the time they came about an hour and 1/2 later, I had passed out one newspaper and that was to a passing car that was very supportive of what I was doing and gave me a water bottle. I may have passed out one more, but that was it. I let Keith, Ed, and Joe have my spot and I moved down to the intersection to concentrate on advertising my sign (there was a lot of traffic). The guys did a little better than I did at getting papers out, but they were there another hour or two longer than I was. Their results proved that I should continue using my sign there. Stirring the pot or "shaking the beehive" gets people talking, thinking, and visiting the site. Here is a video of my confrontation with the LDS ushers and them calling a cop on me for what they claimed was me being on their property. I only went Saturday this time, since Sunday was Easter and I spent it with my family, but I got a lot of work in while I was out there—around 8 hours straight on the street. The stats of those going to check out my site reflected that. I also got into a number of good conversations. One thing that struck me about this time was how many people who honestly told me that their prophets have made mistakes. They are human, so of course they are going to get things wrong. They still hang in there with their religion primarily because of the good feelings it gives them, and of course that must be from God, right? For the last couple years now, a gay guy named Peter has been showing up for General Conference. 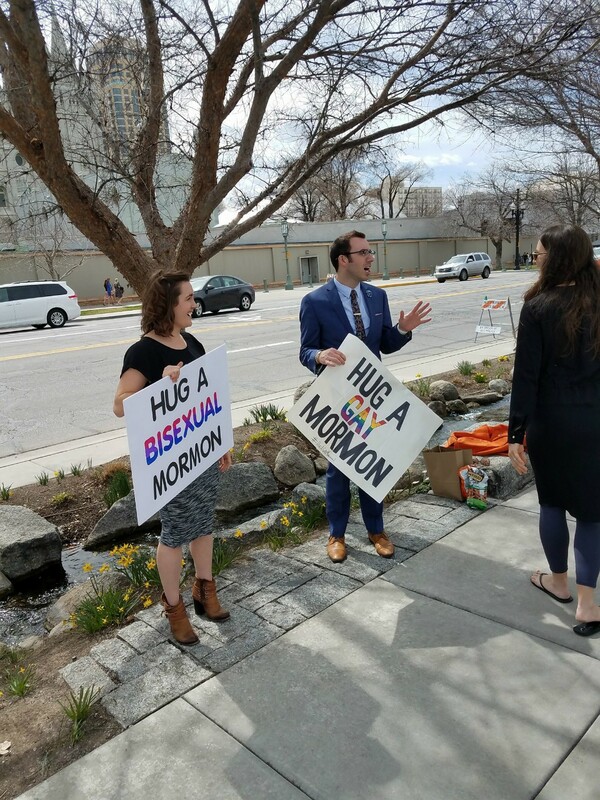 He holds a sign outside on the sidewalk that says, “Hug a Gay Mormon.” This year he was joined by a gal who had a sign that said, “Hug a Bisexual Mormon.” Yes, I hugged them and told them I loved them, but I also told them they need to repent of the Mormon God who is leading them to hell. The gal asked, "So nothing of being bisexual?" I told her, "I don't care what you're oriented to do, but if you go against what God has commanded for you, then you're sinning and wanting to be your own god, and you need to repent of it." I also told her that her orientations are defective due to the fallen world we live in. She said, "You sound a lot like the LDS Church." I said, "Just because I agree with them in some things doesn't mean I agree with them on everything." Kevin Deegan and I talked to a black LDS guy named Gaylord visiting from the Congo, Africa. Of course I asked him about all the racist passages of the Book of Mormon in how God curses people with dark skin and as they repent, their skin becomes white. He really didn’t have an answer for it, but gave the LDS Church a pass, since the gospel was restored to a predominantly white nation in the early 19th century. Many others stories I could tell you about, but let me just point you to three videos I produced which will give you a good overview of what was going on. 1) The first video is of me preaching to the lineup to get into the afternoon session. 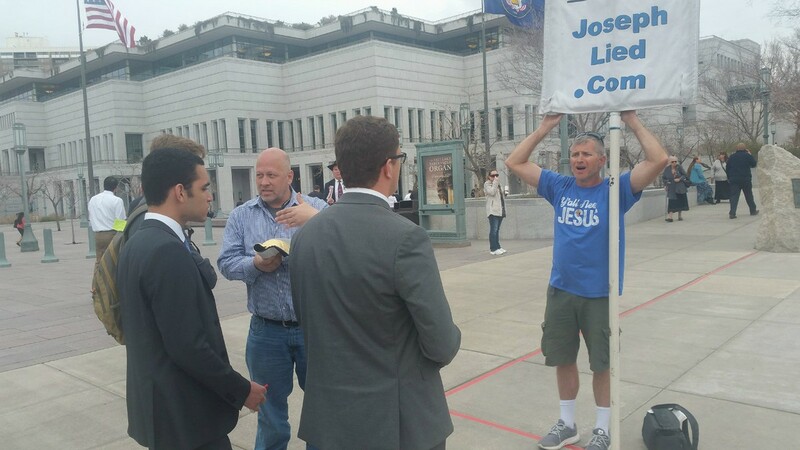 3) The third is of me dialoguing with a couple LDS missionaries prior to the Priesthood session. I talked to these guys again after the session, and they seemed just as hard-hearted. Elder Nunez even said I was just preaching hate. Aaron Turpin came to share his testimony out of Mormonism and atheism and into Christ. You can watch that here and see the pics here. My birthday is on the 18th of this month, so I set up a fundraiser for CCU on Facebook. If everyone did this on Facebook, we would have no trouble with our monthly finances! What’s great about donating through Facebook is that the company they work with—Network for Good—does not charge any processing fees, so we get everything you donate. Why y'all hating on the church fam? Praise the Lord for what you are doing! I was greatly comforted by YouTube videos from your website yesterday. I have again removed loads of motab videos I am addicted to and replaced them with only anti-Mormon videos and recent White House YouTube videos that give me alot of good news without excessive ads. No, no no. YOU are the one who needs to look for truth. I already have answers in the Book of Mormon, thank you very much. I pay attention to the best of my mortal ability in church to soak up what i can and apply it to my life. Oh, and as a matter of fact, an answer to this question would be great: I would like this website to be blocked. When can that happen? Feel free to not answer, it was a rhetorical question. Our youngest daughter has been engaged to a Mormon for the last couple of years. We were told that he and his parents were "Jack Mormons." Under those conditions, and because he was the most conscientious guy our daughter ever dated, we allowed her to date and get engaged. Our daughter lately was talking about the urgency of getting married. We recently heard that she secretly converted to Mormonism and that her fiance baptized her... My wife and I were devastated that our daughter kept this a secret from us for 4 months. She said that she was afraid to tell us. Anyway, I started searching YouTube videos and found your site. "Welcome to our community, you will notice young men riding on bicycles with white shirts, you will notice little buildings next to almost every high school, you will notice churches in almost every neighborhood with high point steeples without crosses." These all point to a religious group entitled, "The Church of Latter Day Saints of Jesus Christ." Their point of persuasion is that they believe in modern day prophets who currently get revelations from god with equal validity to the bible. If perhaps you believe in current day prophets who have this authority, then please find a recycling bin to throw this into, this information does not apply to you. If however you are a new comer to our community and would like to have some knowledge as to the basis for this religious group then please read on...." The primary thrust of this religious group is to seek converts. Warning....you and your children will be confronted by this religious group, and it is best for you and your children to know who they are all about! [I replied:] Sorry to hear about your daughter! If it was my daughter, I'd be clear to her that you won't be able to watch the wedding ceremony if she gets married in the temple. I'd also see if she'd be open to seeing what goes on in there. If so, then show her https://youtu.be/6udew9axmdM and https://youtu.be/KqWB2-BQ_PI. Of course you are welcome to use my site and info in any way you can. Just please make sure that you source it. "No, any homosexual activity is sin. The Bible is clear about that.